John Riley reviews the new Sigma 24-70mm f/2.8 DG OS HSM Art lens for full-frame Canon and Nikon DSLRs. 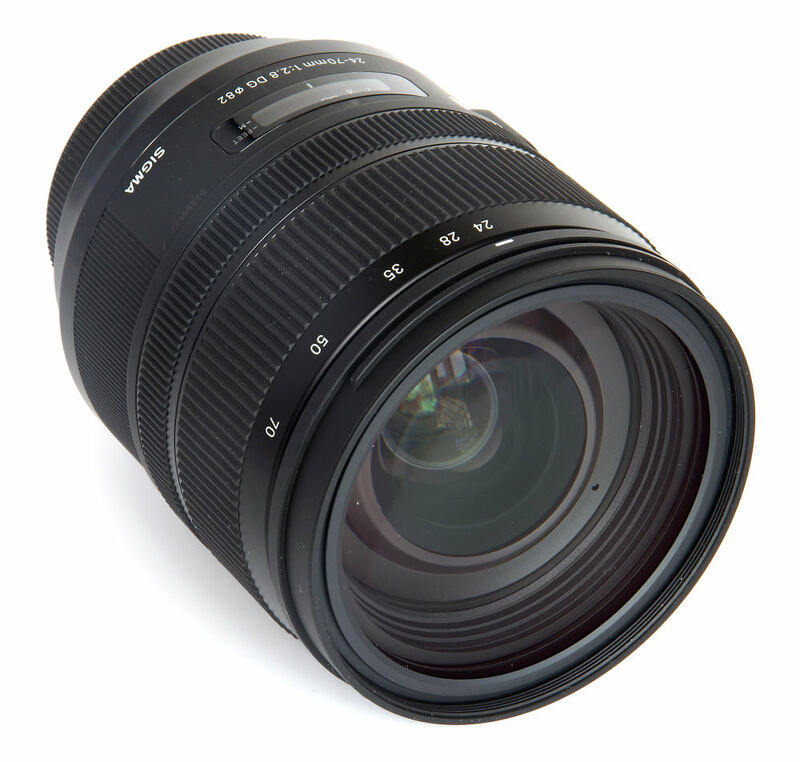 The Sigma Art range of lenses aims at the highest level of optical performance. Coupled with the extremely useful 24-70mm range, such a lens offers the potential of a huge step up from the average “kit lens” often supplied in a package with the camera. Admittedly this also usually means a huge increase in weight and cost, but the end result can be worth it. Let's see how Sigma has balanced the various requirements, using the Canon EOS 5DS R Full Frame 50MP body for this review. The lens looks big and bulky and this is reflected in its fairly hefty 1020g weight. It does balance well on the Canon EOS 5DS R, but there is no escaping the overall weight and a camera sling may well the best way to carry this for any length of time. Operationally, it immediately becomes apparent that Canon style lenses operate both zoom and focusing in the reverse direction to Nikon and Pentax. This is not a problem as such, but something that anyone switching to Canon from the other two would need to get used to. The lens is available in Canon, Nikon and Sigma mount versions, with the option of having the mount changed should the photographer change systems at some future point. The Nikon version has the electromagnetic E type diaphragm, so it is compatible with all the latest bodies. Some earlier Nikon bodies will only be usable at open aperture. Commencing with the provided petal lens hood, this clips firmly into place. There is no locking lever, but the hood seems secure enough. There is an 82mm filter thread. The zoom ring is clearly marked with various focal lengths. It is firm in action and does change the length of the lens as we zoom in. The focusing ring is immediately behind this and is electronic in operation, operating internal focusing. Closest to the camera body we have a distance scale under a small clear window, marked in feet and metres. There is no depth of field scale. At the same point, there are two switches on the lens. The first selects the focusing mode. AF setting is self-explanatory, and it also allows for further manual tweaks when AF has locked on and the shutter release button is held at the halfway point. MO setting is similar but now allows continual manual adjustments even when AF is operating. Finally, MF is fully manual focus. Focusing in AF modes is fast, silent and very reliable. There is no hunting and the AF locks on correctly every time. Focusing is down to 0.37m (15 inches), a maximum magnification of 1:4.8. The second switch selects on/off for the optical stabilisation and testing it out indicates that 3 or 4 stops advantage is a reasonable expectation. This of course enormously extends the potential of low light handheld photography, something that we are rapidly becoming used to. Optically, the lens construction is 19 elements in 14 groups. This includes 3 SLD (Super Low Dispersion) and 4 Aspheric elements. The diaphragm comprises 9 rounded blades, designed to improve the bokeh of the lens, the softness of gradation of the out of focus background areas in an image. The lens mount has a rubber gasket and the mount only is described as dust and splash proof. This no doubt helps to prevent ingress of moisture into the camera body, but the lens itself is not weather sealed. The instructions provided are quite clear that efforts should be made to keep the lens dry, although looking at the tightness and high quality of construction there do not seem to be any glaringly weak spots that might not take a splash or two. We go out in the rain at our own peril and a weather shield might be in order. Compatibility with the Sigma USB dock means that some adjustments and upgrades can be made using this, a convenient feature. The lens is also compatible with the Mount Converter MC-11, which enables the Canon and Sigma fit versions to be used with Sony E-mount mirrorless cameras. Moving up from a kit zoom lens, the 24-70mm may well seem big and heavy. Some of this is a consequence of it being a full frame lens, some the fast and constant f/2.8 maximum aperture and some the high quality of the construction. There is no escaping this, but on the other hand, the handling is excellent generally and the package is reassuringly solid. At 24mm, central sharpness is off to an excellent start from f/2.8 all the way through to f/8. The standard is still very good at f/11 and f/16, becoming soft by f/22 as diffraction really takes hold. The edges are very good from f/2.8 to f/5.6, excellent at f/8, very good at f/11, thereafter falling to good at f/16 and quite soft at f/22. 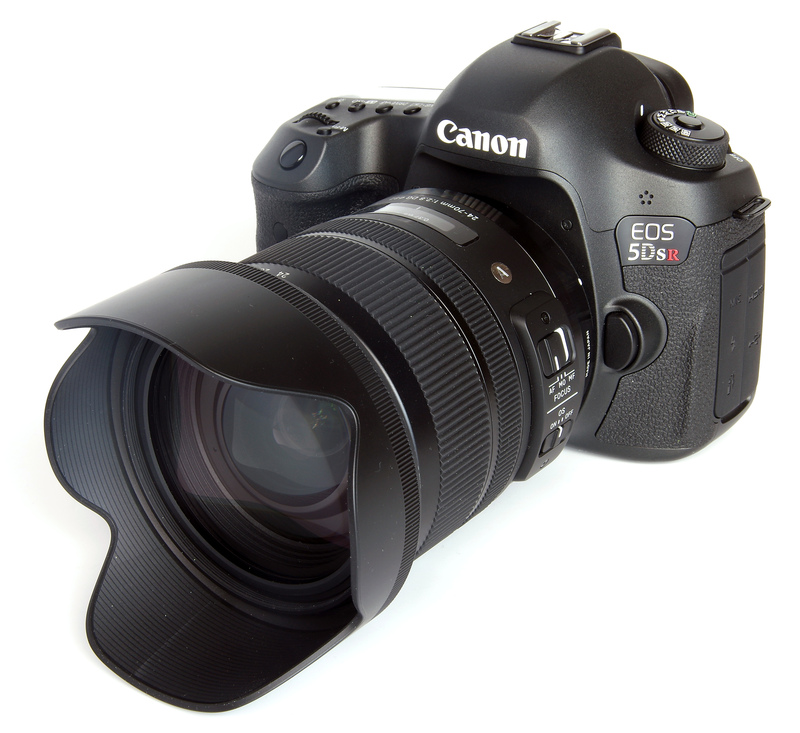 35mm shows central sharpness to be excellent from f/2.8 to f/8 and very good at f/11 and f/16. f/22 is only fairly sharp. The edges are very good at f/2.8, excellent from f/4 to f/8, very good at f/11 and f/16 and again only fair at f/22. 50mm sees excellent central sharpness from f/2.8 to f/5.6. This remains very good from f/8 to f/16, softening at f/22 to fair levels. The edges are very good at f/2.8 and f/4, excellent at f/5.6, very good from f/8 to f/16 and just fair at f/22. 70mm sees excellent central sharpness at f/2.8 and f/4, very good performance at f/5.6 and f/8 and then just fair results from f/11 to f/22. The edges are just fairly sharp all the way through the range, from f/2.8 to f/22, peaking at f/4 but never becoming stellar. For this review, the lens was tested on a Canon EOS 5DS R using Imatest. CA (Chromatic Aberration) is very tightly under control in the centre at all focal lengths. The edges do show some fringing, but particularly at 70mm. This can, of course, be attended to in software, either in camera or in Photoshop and other suitable programs. Distortion is good for a lens of this type. We find -2.86% barrel distortion at 24mm, quite visible in architectural shots, but correctable in software if deemed necessary. 35mm is almost perfectly rectilinear, measuring just -0.07% barrel distortion. This changes to +0.98% pincushion at 50mm, still very reasonable. 70mm measures +1.70% pincushion, noticeable in some shots but actually very fair for a zoom lens. Flare does not seem to be a problem, despite the optical complexity of the lens. Clearly, the barrel design and coatings are efficient at reducing internal reflections. There may be a slight loss of contrast in the most challenging situations, but generally flare is not visible. The 9 bladed diaphragm promised excellent bokeh, and indeed it is very smooth. This is also helped at 70mm in particular, where the lower sharpness levels of the outer areas of an image mean that portraits can be critically sharp at the eyes, but the background can be diffused and smooth. What is in technical terms a lens defect can often be turned into a pictorial advantage. There is potential here for use as a very satisfactory portrait lens at the longest focal length. 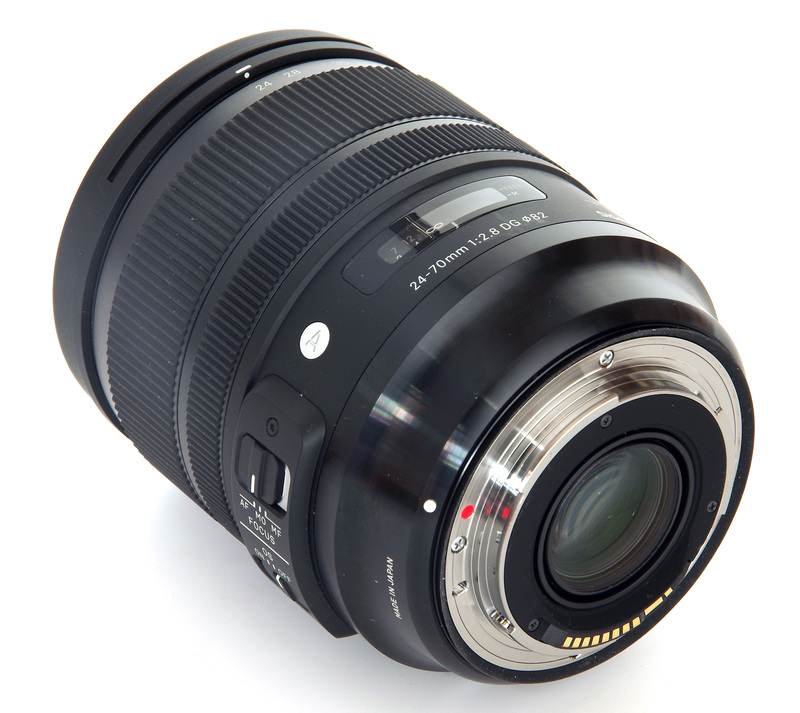 The 24-70mm f/2.8 DG OS HSM Art lens is priced at £1399. The Tamron 24-70mm f/2.8 Di VC USD G2 lens is priced at £1249. Both these lenses aim at the same ideal, the Sigma being available for Canon, Nikon and Sigma, the Tamron just for Canon and Nikon. It is worth repeating that the Sigma lens can also be used, via an adapter, on Sony E mount mirrorless cameras, at least in its Canon or Sigma variations. As the Sony FE 24-70mm f/2.8 G Master lens costs £1899 this is something that could well be of interest to Sony users. 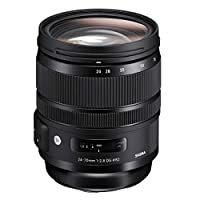 For the sake of comparing what all marques offer their users, we can find the HD Pentax-D FA 24-70mm f/2.8 ED SDM, a remarkably similar lens to the Tamron, at £1149. Canon offers the EF 24-70mm f/2.8 L II USM (£1699) and Nikon the 24-70mm f/2.8E AF-S ED VR (£1899) and 24-70mm f/2.8 G AF-S ED (£1549). Finally, there is the Tokina 24-70mm f/2.8 AT-X PRO FX at £949. The new Sigma lens may seem expensive, but it is about par for the course and actually quite a bit less so than some of the other options. Value for money seems to be sound. 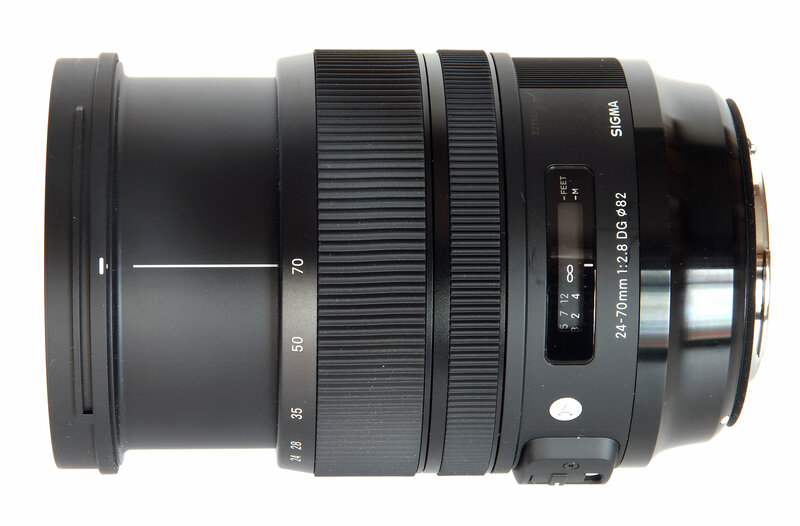 For more options have a look at the Top 21 Best Sigma lenses. This is a very attractive proposition for full frame users. A reasonable cost, a sound general performance, gorgeous bokeh and the potential for portrait shooting, low distortion, in fact, a variety of positive aspects that make for a quality end result. It's a pity the weather resistance isn't a bit stronger and the weaker performance at 70mm will not suit everyone, but even this may well delight others as the portrait and perhaps flower study potential is very real. Overall, recommended. A well balanced standard zoom lens with potential for creative portraiture. With thanks to CliftonCameras who provided the Canon EOS 5DS R used for testing. 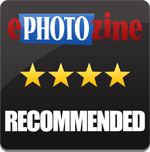 A rather odd review rather late and a fair time after release and most generally criticising this very expensive lens. The use of a 50 mega-pixel Canon to illustrate limits of the glass are useful. Perhaps Sigma are not getting the sales they need and are pushing a few of these out to reviewers? Announced in February but not readily available in the UK until recently and even now not a lot seem to be in stock. That might be due to the steep asking price of around £1200 Anyhow, that lateness is not my concern. Grateful for this review. I might just rob a bank and get it!